This beautiful lady was born Maude Hawk in Memphis, Tennessee, on March 3, 1881 (sources vary on the year). 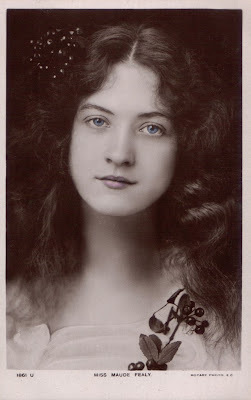 Her mother moved to Denver to teach at the Tabor School of Acting, and Colorado was home to Maude Fealy for much of her life. Her mother Margaret Fealy was an actress, and Maude made her first appearance at age three and was performing dramatic roles at age five. 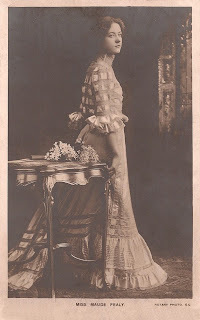 By 1907 she was a well-known actress, appearing on magazine covers and touring the the United States and England in comedies and dramatic plays to general critical acclaim. Maude secretly married English theater critic Lewis Hugo Sherman in 1907, but the union was short-lived, due largely to her mother's active sabotage. 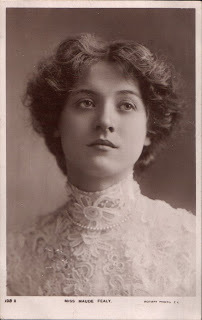 Maude married actor James Peter-Durkin in 1909, with her mother's full approval, and the couple used Maude's financial resources to form the Fealy-Durkin stock company which performed plays in Denver for a few years. This marriage also ended in divorce in 1917. 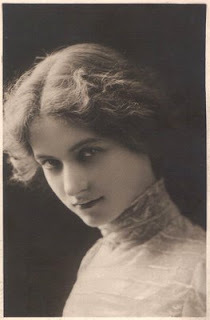 There are unsubstantiated rumors that Maude Fealy was at one time romantically involved with fellow actress Eva La Gallienne and may have been a lesbian. Maude's third and final marriage, to her manager John Cort, ended in annulment in 1923. 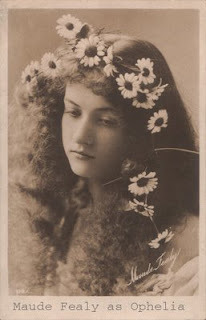 Maude Fealy was associated with the Thanhauser film company for several years, and was the leading lady in numerous early silent film productions. She continued to appear in plays in cities across the country. In 1917 she formed her own theater company, The Lakeside Theater in Denver, which produced a variety of plays including at least one she wrote herself. Theater magazines of the day report that she was 5'1" tall with dark blue eyes, and enjoyed art and books, pets and plants, swimming and writing. During the Depression Era of the 1930s, Maude was involved with the Federal Theater Project and the Works Progress Administration in Los Angeles. During the 1940s she taught acting classes in Denver, and appeared in occasional small film roles throughout the 1940s and 1950s. She was great friends with Cecil B. DeMille and appeared in many of his films including the 1956 production of The Ten Commandments. She had a small part and also did the voice-over for several other players. Fealy and DeMille had met and become friends years earlier when they performed a swordfight together in the play Dorothy Vernon of Haddon Hall at Lakeside Theater. 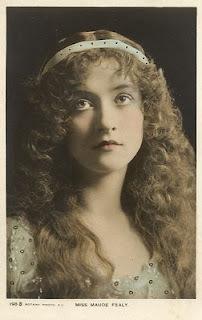 Maude Fealy once said, "Actors never give up acting; it gives them up." She officially retired in 1957, but was active in the theater throughout her life. She continued to give one-woman performances and lectured on Shakespeare. She lived in Denver for many years, but died in the Motion Picture Country House and Hospital in Woodland Hills, California, in 1971. She was interred at the Hollywood Memorial Park Cemetery Mausoleum, close to her mother. Funeral expenses were paid by the estate of Cecil B. DeMille, as he had provided in his will (he died in 1959). No close relatives survived her. Despite spending nearly all of her life in the public eye to one degree or another, Maude Fealy seems a bit of an enigma. She is remembered as one of the loveliest ladies of the stage and screen, and her postcard images are among our most popular. Lovely site. There's a lot of Fealy material, found in a trunk in a Denver theatre that I've posted online at http://web.me.com/jaylenewallace/Maude_Fealys_Treasure_Chest/Welcome.html. Materials include photos, personal, business and fan letters, Screen Actors' Guild card, and baptism certificate.